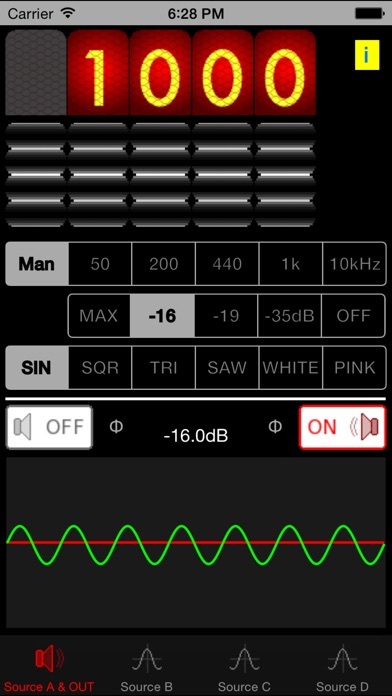 This App is a powerful test tone generator. Yet it is extremely simple to use. No other audio generator App is as complete as this one whatever its price ! You can combine (add) up to 4 independent sources and send the result to left and/or right speaker. There is a phase switch for each channel. Available test tone types are: sine wave, square, triangle, saw tooth, white noise, pink noise. As you can see on sample images, first source is very basic and thus very easy to use. Second source is more complex and allows sweeping of frequency for sine waves. Third source is quite similar to the previous one except that frequencies are aligned with a musical scale (reference is 440Hz). Fourth source is for narrow band noise. Rotating knobs are there to ease frequency selection. The display at bottom of first tab is a rough waveform viewer, to monitor the generated signal. The output RMS power of a channel is indicated. Clipping is indicated as well should it occur (sources are added). Any comment, any feedback ? There is a blog for this. Note that the built-in speaker cannot reproduce the highest and lowest frequencies (below 400 and above 11000Hz to give an idea). You will ear these frequencies only with a good headphone or HiFi system.